On this day in 1937, one of the coolest people to ever walk the face of the planet disappeared somewhere near Howland Island in the middle of the Pacific Ocean. Amelia Earhart had been the first woman to fly solo across the Atlantic Ocean, and in 1937, she was attempting to circle the globe. As we all know, she didn't make it. 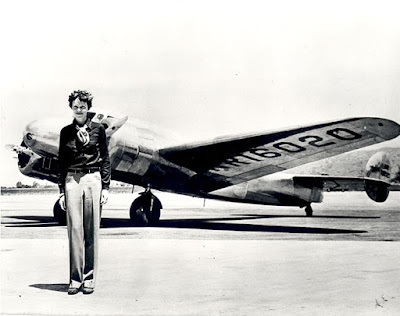 When looking back on Amelia Earhart's achievements, it's important to realize what a pioneer she was. Although there were other female pilots in the early 20th century, most women worked in the home--and not necessarily out of choice. As you may recall, women in the US weren't even allowed to vote until the 19th Amendment was ratified in 1920. (When Earhart was 23 years old.) So Amelia's solo flights--which were extremely dangerous--sent a powerful message to the entire world. These days, though, people are often far more fascinated by Amelia's disappearance than they are by her achievements. Despite a massive search, neither the pilot nor her plane were ever discovered. (My grandfather was part of the search effort!) Some believe the plane crashed and sank. Others say Amelia made it to nearby Gardner Island--where she perished. Discoveries on the island (improvised tools, an old fashioned shoe heel, and even the skeleton of a tall European female) seem to support this theory. The skeleton, of course, would have offered definitive proof, but the bones were misplaced long before modern forensics could confirm their owner's identity. Check out Amelia Earhart's Wikipedia entry. Read about the most recent developments in her disappearance here. Huh. I forgot today was jer dissappearance day. I did a biography on her in fourth grade (it took me two months) and I believe she's a mystery not meant to be solved. "...but the bones were misplaced long before modern forensics could confirm their owner's identity." Convenient. 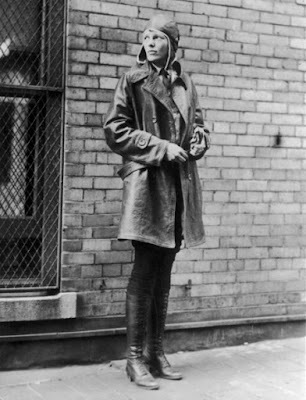 But really, Amelia Earhart was amazing. I love her, she is one of my heros! So tragic. It figures that, if a well-known girl had to go missing, it'd be someone amazing. Oh well, my anti-celeb bias is showing again. That is really cool!!!! She was really brave. Amelia was and is a great role model. I saw an episode of the Time Warp Tro, where they meet Amelia Earhart and discover that her disapperance was caused by one of the members of her team or something. I can't remember exactly, but it was a good episode. she was awesome. my mom wanted me to dress up as her for halloween, but the aviator pants were 3 sizes to HUGE! i would have if it fit me.